Offa Grammar School shall never perish. The school was conceptualized by certain indigenes of Offa who way back in the late 1930s had seen education for the people of Offa as a vehicle for development. Their drive was given impetus by the socio- cultural movement of the town, the Offa DescendantsÃ¢â‚¬â„¢ Union (ODU). 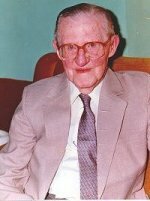 Largely due to the great effort of Reverend RN Ludlow, a British missionary, the school became established in February 1943, and what was initially a dream was translated into reality. 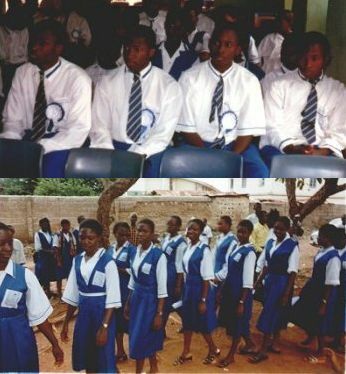 From its early very modest beginning with 18 students (in the picture at right), it has grown vastly in status. The current student enrollment is over 2000. The schoolÃ¢â‚¬â„¢s all round achievement is a reflection of the dedication and industry of the Principals and Staff members the school had been blessed with over the years. Our gathering here today is an absolute testimony of God's mercies and protections over our lives since the last conference. Therefore, I must start by glorifying the Almighty God for enabling us to witness this day. I am particularly pleased and delighted to welcome distinguished and accomplished members of the Old Students Association as well as other invited guests to our great Institution. I also feel overwhelmed and honoured to be given the opportunity to address this august body. Your interest and love for your alma-mater has a significantly positive correlation with the educational and infrastructural development of the school and the present generation of Students are the better for it. Not many schools in the present day Nigeria will count themselves lucky to be so blessed as ours. At this juncture, I must pay glowing tributes to the veterans and past leaders of OGSOSA living and dead for their sacrifices while they were at the helm of affairs. 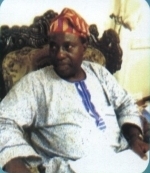 It is not long ago that we lost to death one of our foremost President, Chief Jide Falokun whose funeral ceremony was hugely attended by the entire Staff and Students of the school. May his soul and those of all other deceased members of your association continue to rest in peace and may the labour of these heroes never be in vain. On behalf of the Staff and Students, I am particularly pleased with the support we have received from you as well as your huge investment in the education of these Students. The current school population is 2468,comprising of 1206 and 1262 Students from the JSS and SSS respectively out of which only 52 are boarders. The school is most sought after by admission seekers of secondary education status due to its infrastructure and academic exploit. The latest rehabilitation workdone by the CBN which was completed in 2014 and the donation of a block of six classrooms by AGIP have added value to the school. The dotting presence of the Old Students Association in various spheres of school life is unparalleled. The Staff strength for the JSS and SSS is 46 and 42 respectively with additional three teachers employed by the OGSOSA since September 2012 and another two teachers recently employed by the class of 1970/74 set mandated to teach English Language and Mathematics in the school effective from January and to last till July this year and with a possibility of renewal by the set at the end of the session. In addition to this, the school secured the services of Youth Corps members with monthly stipends to stimulate them for better productivity. The school equally secured the services of two teachers and four security guards to complement what is on ground. One of our most crucial needs which is our bane is the lack of perimeter fencing of the school that will confine our Students and checkmate vice habits like truancy, lateness to school, sneaking in and out of the school at odd hours. Infact, most of the disciplinary problems being addressed by the school are traceable to lack of adequate perimeter fencing. We are thankful to God that all acts of indiscipline exhibited by our Students are not beyond what we can tackle as majority of the Students have been reformed through meting out appropriate punishment and consultations with their Parents. Other challenges trailing this are inadequate Staff in some critical subjects, arbitrary transfer of teachers without replacement, inadequate sporting facilities to practice during sports and games. The female hostel that was ironically left out of the CBN rehabilitation has depreciated and the extensively leaking roof tops have defied all manners of repair and are therefore beckoning for large-scaleassistance. The old school Bus that is grounded in the school need to be done away with or rehabilitated to functional status to prevent further deterioration. That Offa Grammar School had a rich academic past is not in doubt. Today we are still trying our best to maintain the good standard that has made the school the envy of all. I must say that the setting is not the same as in the past. The situation and the environment have changed especially with Information Technology and socialization. The emphasis is different from what it used to be notwithstanding that the Parents and Staff have a lot to do to get a balance by enforcing the Students to work hard. This is what we do in Offa Grammar School todayand the result is there for us to see. We are doers and not dreamers.Our albatross that has to be checked to sustain and preserve our exploit is the culture of impunity among an insignificant fraction of our team which is more of a national problem. We give praise to God that with His assistance and the efforts of our dedicated members of Staff, the school has not only maintained last year academic performance, it has surpassed it with additional feat long sought after as one of our Students TAIWO SULYMAN had the singular honour of recording a distinction with aggregate 11 in the last WAEC exam, a position that qualified him to occupy a space in the school honours roll. The result gives us hope that a lot of potential lies with our Students if provided with the right atmosphere. A lot more was required to be done to move the school to the standard that would support real human capital development especially as the trend is towards entrepreneurial development. The Old Students Association under class Sets or National Association has been relentless in their struggle to see that their school develops. I have watched with disbelief the ways and manners you are seeking ways to restore the schools glory by enthusiastically taking up projects for rehabilitation and this has equally challenged the authority to want to do more.Over the years, you have used your own ways and means to contribute money and sacrifice time to refurbish and donate a significant part of the school structures viz the science laboratories, the hostels, the classroom blocks, home economic laboratory and many more things that are documented in the history of the school. You have equally built a magnificent hall and provided services viz transportation and water supply. Most of these contributions have remained the legacy that you left behind for the present generation of Students. I must say that O.G.S is enjoying immense support from the OGSOSA. While it is right to pay tribute to the Association, I think it perfectly justifiable to single out on occasions like this, the current contributions of individuals and groups that have supported and assisted the school in the course of the 2014/2015 academic session. Donation of a high-grade multifunction photocopier and printer by the class of 1983 set. Donation of #100,000 cash by Engineer Paul Adubi of 1975 set used to purchase sporting equipments. Award of scholarship to cover WAEC registration fee amounting to #16,000 each to ten best Students presented by the Yunus Folorunsho Oyeyemi Foundation. The choice of the rehabilitation of the library as a project by the class of 1975 and commencement of spade work to determine the cost involved. The employment of one teacher each in English Language and Mathematics to boost the Staff strength by the class of 70/74 set. Award of scholarship to some final year Students to cover 2014/15 WAEC registration by the 2001 set. The various captions on wooden slab fixed at strategic part of the school premises calling attention to the Students to submit themselves to school rules and regulations and to be worthy in character and learning done by the 2000sets. The clearing and evacuation of huge waste that were illegally dumped by our dirty neighbors at unholy hours at the vicinity of Sofoluwe hall as executed by the National body (OGSOSA). A member of the class of 1987 set Mr. Waheed Lafenwa for funding the repair of damaged doors and ceilings of two classrooms in the junior block. The rehabilitation of the Oyeleke hall which is in an advance stage of completion by the class of 1961/65 set. We equally acknowledge and welcome the intention of the class of 76 to revive the school orchard. We equally salute the philanthropic gesture of the Abuja branch of OGSOSA for their consistent donations of prizes to deserving Students during the school graduation ceremonies. Mrs. Siyanade Fayiga (nee Oyewoye) who led a team of Christian Yoruba Mothers based in USA and presented an LCD Projector for our use. The ODU North America (ODUNA) Scholarship awards which has been on for some years back has been of immense benefit to our Students. Donation of books by Professor A.B.O Oyediran and siblings to the school library. The KITE Club that has sponsored competitions among Secondary Schools in Offa and awarded prizes of which Offa GrammarSchool has always benefitted yearly. The Zenith Club of Offa that Awarded Scholarship to indigent Students in Offa including those from the school. Lawyer Opadokun Annual Bursary to best Students in Senior and Junior Secondary Schools of which Offa Grammar School is a beneficiary. All the above and many more are interventions that will contribute to impact positively on the life of the Students and the school. It's my earnest appeal to urge other potential helpers to recognize and initiate awards to stimulate not only our Students to greatness but to the staff to spur them for better productivity as "Without teachers appreciation, there can't be any student progress"Â. Theresa Grimm. The school had the singular honour of organizing one of the most colourful athletic competitions this year through which several sporting talents were discovered. The school's relay team in both boys and girls has been quite outstanding this year winning laurels upon laurels. The newly packaged school Bus added glamour to all our outings and expectedly stimulated our performance in this regard. Some of our achievements at the various invitation relays in which the school participated are highlighted below. In addition, the Super Cup Football Competition organized by Adesoye College was won by the school with the award of a giant trophy. The school equally featured in the volleyball competition sponsored by M.D of Pioneer Rentals Alhaji Sefiu Oladipo and came third in the male category. Also Clubs and Societies meetings and activities were carried out as some of them have been shaping the future skills of our Students. The Press Club, the JETS Club, Interact Club, the Health Club and the Road Safety Club have been quite outstanding in their activities while appeal is being made to other waning Clubs to wake up from their dormancy. In January this year, one of our Students, Taofeekat Raji of SS3Sci1 singly represented Kwara State in the Mandatory Continuing Professional Training (MCPT) Essay competition North Central zone comprising of six states and clinched the second position. The school as usual came first in the KITE Club organized essay competition and was presented with a Generator this year. It is with profound gratitude that I once again register our deep sense of appreciation to all individuals and groups that have been involved in attaining our present performance and sustaining us to the present level we are. The joint cooperation of all and sundry is equally acknowledged. Thanks in no small measure to the following: His Royal Highness, the Olofa of Offa and his traditional Chiefs for their spiritual roles, various Government agencies: the Ministry of Education, Teaching Service Commission, the Quality Assurance Bureau, the NYSC, the Nigerian Police and Civil Defense Corps, the Medical Director of Offa Specialist Hospital and the Federal Road Safety Commission for their various roles in the school. Finally, it is equally relevant to acknowledge once again the remarkable performance of the Staff of this school for their discipline and responsible behavior which have sustained the peaceful co-existence between the Principals and Staff. In conclusion, I thank you all for the opportunity given to me to address this gathering. I wish you successful deliberation and journey mercies back to your respective destination. On behalf of the Board of Governors, Parents/Teachers Association and the entire Staff andÃ‚Â Students of this great School, I am particularly pleased and delighted to welcome you all to the 70th Year Anniversary of the existence of the School. I know thatÃ‚Â reaching a milestone of this magnitude of long hlstory of achievements of the College will not go uncelebrated especially by you, the great Old Students having critically viewed your past antecedents before andÃ‚Â immediately on my assumption of duty as the Principal since September 2012. Your concern for succeeding generation of students as exemplified by your ever doting presence and emotional and passionate attachment to the school is unequal and a reflection of your love to the School. I do not intend to treat you to an unduly lengthy discourse, it is however pertinent that I appeal for your patience as I share with you a brief situational report of some of our problems, hopes, aspiration and stewardship. Copyright © 2019 Offa Grammar School, Nigeria. All Rights Reserved.